to scarring the landscape. Now it wants a rate increase. The cover of Friday's Newsday was headlined "NY Comptroller Report: LIPA Reform Hurt Customers". Comptroller Thomas DiNapoli said ratepayers are facing higher bills, less transparency, more debt and less oversight. The NY Department of Public Service (DPS) said later than day that DiNapoli was "simply wrong", citing a three-year rate freeze and "unprecedented" oversight. DPS said the 2013 reform was a "success". PSEG, which operates LIPA's power delivery, said reliability, storm response, call center and other measures have improved on its watch. LIPA spokesman Sid Nathan said the Authority had been ordered to bring "the most efficient and lowest-cost service to customers." Assemb. Fred Thiele (I-Sag Harbor) applauded the report, calling the DPS idea that the reform was a success "ludicrous". 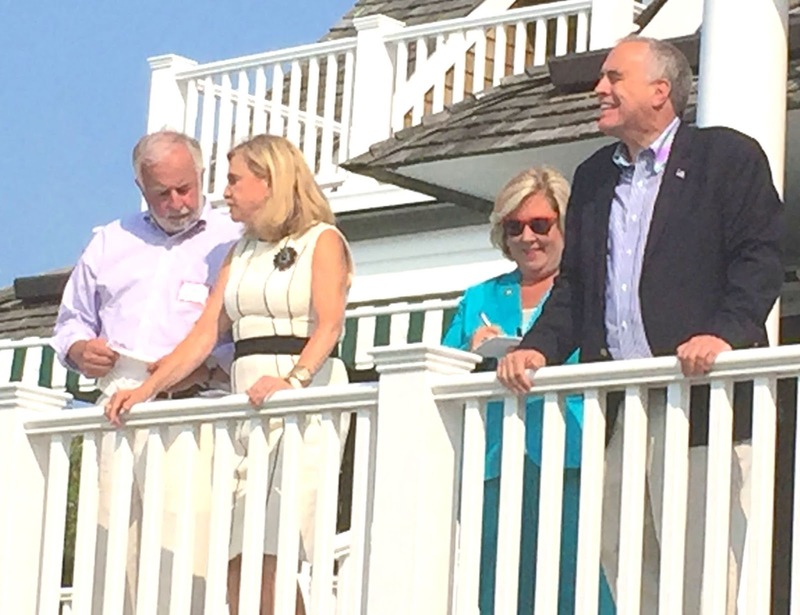 "We are facing a substantial rate increase that Long Islanders can't afford. DPS has ... totally lost public confidence." Brookhaven Supervisor Edward Romaine said he was glad the comptroller focused scrutiny on the LIPA-PSEG rate hike, calling for "an audit from the state comptroller so we get accurate numbers and an independent review". George Maragos, Nassau County's comptroller, agreed with DiNapoli's critique of the PSEG- LIPA contract, including its attempt to stop DiNapoli from scrutinizing contracts. He said: "The agreement between the state and PSEG has to be rethought and more controls put in place." Jennifer Freeman, a spokeswoman for DiNapoli, said, "We'll let LIPA ratepayers judge whether the latest reforms are working or not." When I worked for the NYC Comptroller's Office as Chief Economist in 1992-2006, I testified several times for the Comptroller on behalf of electricity consumers against rate increases for Con Ed and a proposed merger. Our intervention turned out to be on the winning side in all cases. It is good to know that Comptroller DiNapoli is putting the power of his office behind protecting the Long Island consumer of power. My experience with PSEG on Long Island does not give me confidence that PSEG is being honest with the communities that it has agreed to serve. It has erected huge toxic poles (see photo above) in defiance, or ignorance, of local laws and precedents. Burying the lines would make electric power more storm-resistant and would not mar the landscape or poison the water. It has a history of claiming not to have known that there were local laws requiring environmental impact statements and local planning filings for new poles, followed by earnest promises that next time it will be more respectful of community laws and regulations. 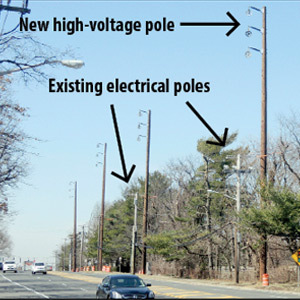 Communities are faced with the expense of taking down the poles after they have been erected, instead of being offered the option of contributing to burying them, as Southampton agreed to do. rate has not yet recovered. 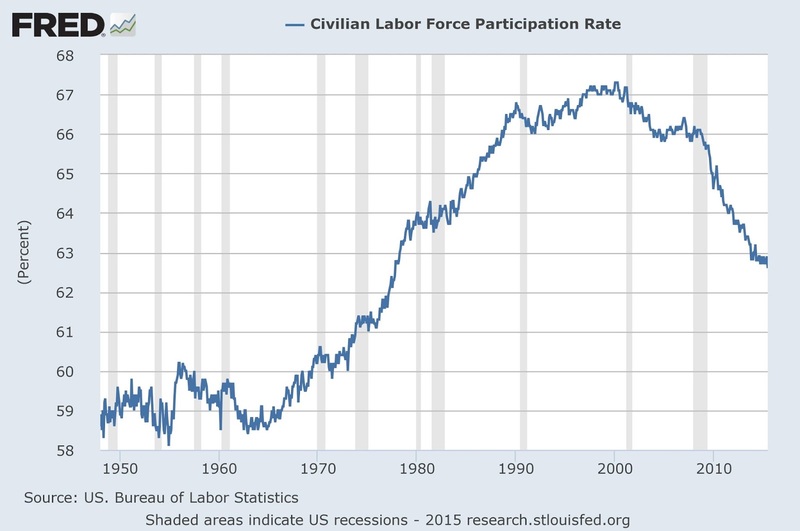 Chart of BLS data by the St. Louis Fed. 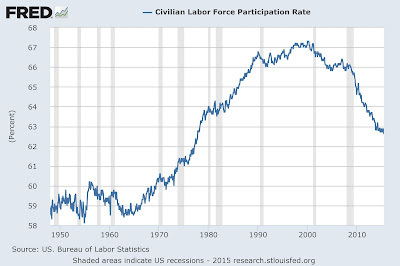 In October last year I posted here something on the decline in labor force participation. 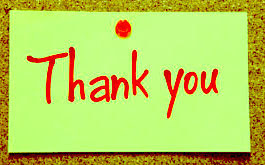 It had more than 1,000 page views and I added two follow-up posts. Last week the Joint Economic Committee of the Congress held a hearing on the subject. Younger people entering the workforce later? Yes, he says that more young people are delaying the start of the working careers by remaining full-time students. Unexpectedly slow recovery from the deep financial crisis of 2007-08, and the difficulty that laid-off workers have had in re-entering the workforce. Federal disability programs, described as a "shadow unemployment program", because they reduce incentives to look for work. A rising number of single-parent families, where the head of household has difficulty holding down a job at the same time as looking after children. Other explanations are offered in my three prior posts. The latest data suggest a possible bottoming-out of the rate. Mason ("Mase") Gaffney has sent around the following note to his mailing lists, noting that he correctly forecast the China crash several months before it happened. He was in print predicting the crash would happen in 2015, and the article was published in March 2015, which was pretty brave for an academic economist. Generally you try to predict so far in the future that no one is likely to remember your prediction. This rule is violated by the people (like Reuters) who publish a forecast of the job numbers on the first Friday of every month, up to an hour before the job numbers are released, leaving themselves open to contradiction within minutes. If you give a date, don't give a number. If you give a number, don't give a date. I believed Gaffney when I first read his article in April 2015. I sold out all my stake in the China fund at Fidelity on April 21, 2015. Not quite at the top of the market, but as Bernard Baruch once said, "the only people who buy at the bottom and sell at the top are liars." Gaffney is eager to let people know about his successful forecast, because it is evidence of the validity of his underlying views, which give more emphasis to land values than mainstream economists. The idea that land values should play a bigger role in economic analysis resonates with me. The history of the American Revolution, especially why the southern states joined with New England, history would be more understandable with more emphasis on land values in the territories claimed by Virginia and then made part of Quebec by George III. I acted on Mase's advice and saved myself from losses on the China Fund. His risk-taking deserves some reward, which I am providing in the form of a Thanksgiving. God Bless Mase, Henry George, Everyone. Here is his email, in bold face to set it off from the rest of this post. In March 2015 I published a forecast (attached) that China’s economy would crash in that year. China promptly did so in July, around our Independence Day, while our press was obsessing over threats from ISIS kamikazes and the drama of Greece, a tiny nation next to China. I am indebted to Cliff Cobb, Editor of The Am. J. of Ecs. and Sociology for letting me go out on a limb in his journal. 1. It is largely independent of what passes for mainstream analysis by the most visible economists today. 2. It gives a central role to land markets as leading autonomous factors in the cycle, building on while varying in important details from Henry George’s pioneering observations in 1879 (call it “exegesis”). 3. It incorporates the reverberations between land pricing and deposit expansion by commercial banks. 4. 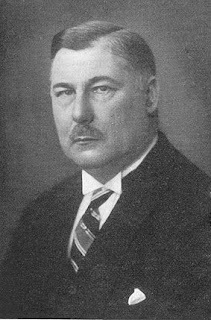 It incorporates the “Austrian School” emphasis on the role of capital turnover, but without the narrow focus on central banking found in most Austrian works, and without the philosophical anarchism. My aim in circulating this information widely is not to play the Donald Trump, but rather in the hope that the success of its risky forecast will lead to a wider acceptance of the role of land and its pricing in economic analysis. The following posts are the most-read on this blogsite during the past month (June-July 2015). Tim Bishop. Photos by JT Marlin. 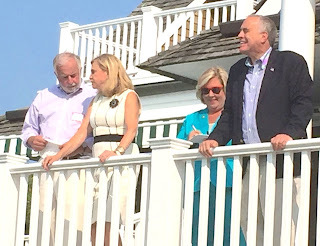 July 8, 2015–Mitch Draizin kindly opened his $3 million Sag Harbor house for a fundraiser for Democrats on Sunday afternoon. Mitch is principal of Longview Capital Advisors, Inc which serves middle-market NYC real estate developers as a financial advisor, as well as a mortgage and investment banker. Mitchell serves as a Trustee at Truman National Security Project/CNP, Advisory Board for The New Leaders Council (NLC), NY/NJ Board of Directors for Playworks and Board of Directors for The Congressional Award. 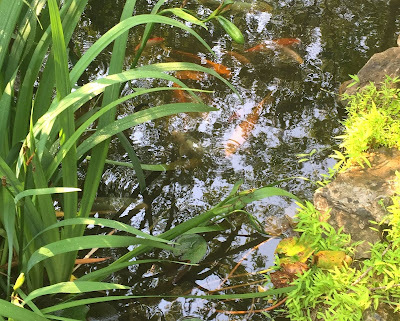 Lots of carp in Mitch Draizin's fish pond. He mentors young people who are entering the real estate and finance professions. He is also a volunteer teacher of a high school course in Economics and Entrepreneurism in two NYC schools. Introducing them were Former Rep. Tim Bishop, NY State Comptroller Thomas P. DiNapoli, and Eleanor Roosevelt's biographer Blanche Wiesen Cook. NYC Public Advocate Tish James was there and conducted a highly effective auction of a lunch with Blanche Cook. My bid was lost in the dust. Tom DiNapoli gave what I thought was an effective introductory speech. He was elected with 51 percent of the vote in 2010 and 60 percent in 2014. 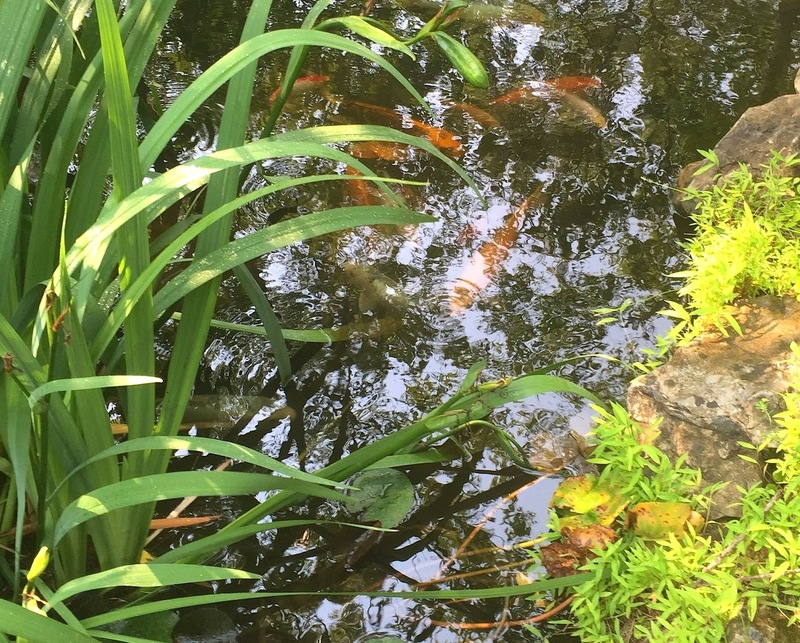 Mitch Draizin's house has a fish pond with a fine collection of carp. I spoke with Rita Wasserman of Springs and Clare Coss, the playwright whose well-reviewed play Dr. Du Bois and Miss Ovington was produced in New York City in February. CHINA | Is It 1929? China Stock Prices Down, Volume Up. July 8, 2018–China's stock market is the second-largest in the world after that of the United States. It is now in a free fall that extensive government intervention does not appear to be slowing. 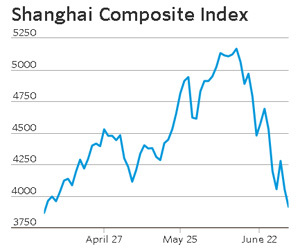 The major Chinese market has fallen by one-third from its seven-year high last month and continued to drop today. Expectations are for a further drop despite suspension of trading in one-fourth of listed stocks. Is it 1929 in China? The political impact of 1929 in the United States was enormous, ushering in two Democratic decades in the White House, FDR and Truman. FDR and his Treasury Secretary (William H. Woodin) declared a bank holiday, printed money for the banks and opened only the solvent banks. They required the sale to the government of privately held gold. Later, FDR devalued the dollar against gold (i.e., raised the price of gold). FDR instituted projects to create new jobs. The program worked until budget-balancing came back in 1936, causing a brief dip again in the economy. 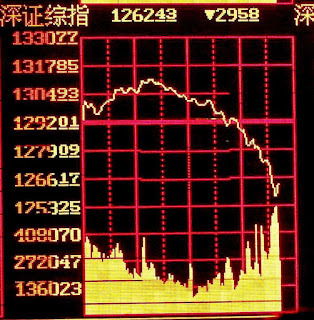 The political impact of the stock market collapse is likely to be great in China because 80 percent of investors in the Chinese market are reportedly individuals, many of whom borrowed money to increase their stake in the market. photo courtesy of Hester Boissevain Grinberg. In the Chapter on Wally van Hall and the Financing of the Resistance, I briefly mention Elisabeth (Lies) Boissevain Land. Her father's name was Walraven Boissevain. She was employed before the Occupation as a schoolteacher. 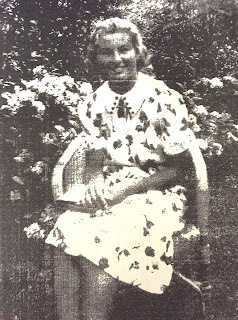 During the Occupation, she worked as a courier and secretary for van Hall, the "oil man" (financier) or Prime Minister of the Dutch Resistance. 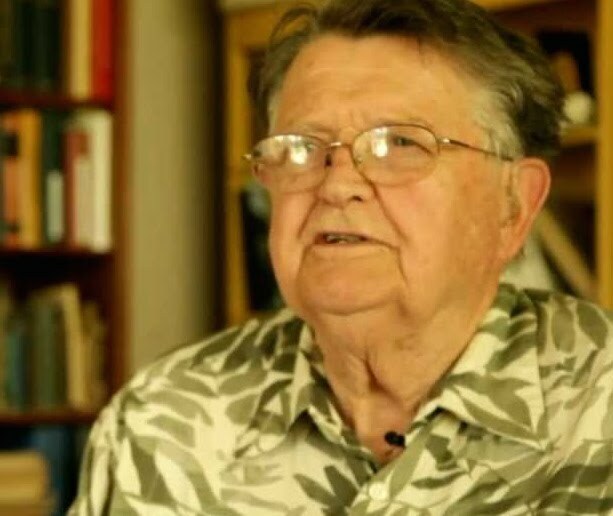 Wally van Hall found, as the war progressed, he could trust very few people and that is why he looked for help from among his family. Near the end of the war, in December 1944, Lies was discovered to be working for the Resistance. She managed to flush the key to Wally's office in toilet. She was put in solitary confinement for five months, but she revealed nothing. Two years ago Lies sent to Hester Boissevain Grinberg (daughter of Bob Boissevain) a poem that describes her feelings as a young child in the prison. 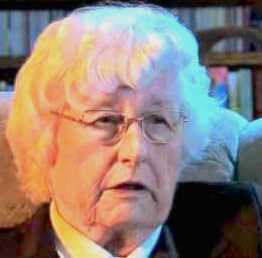 Hester says that Lies told her a few years ago: "Tell people, especially children, as much as possible - not to forget World War II." Here is the beginning of the poem Lies wrote in the "Hunger Winter" (1944-45) of the Nazi Occupation of Holland. Any substantial stores of food they could find in Holland, the Nazis sent by train to Germany. In a cell with a heavy bolt. So wintry, silent and cold. Locked in by those prison doors. Broke the silence and the gloom. With only water and bread? How could I battle this fear? Torture seemed a real threat. These men would force me to speak. They had their methods, while I was weak. the war for the next generation. Four steps to the right. Fragment uit het interview met Lies Boissevain (1924-2014). Zij raakte betrokken bij verzetswerk in de betere kringen in Amsterdam: dat van de - later bekende - verzetsfamilie Boissevain, en het NSF (Nationaal Steunfonds) van Wally van Hall. Ze werkte als koerierster en een soort secretaresse. Tot het misging en ze werd opgepakt.